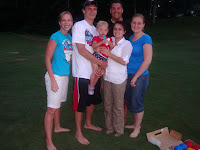 We finished teh day with our besties at the Indian Hills Golf Club to watch the fireworks. 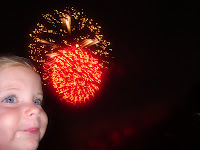 Sierra was a champ last year with the fireworks and didn't freakout so I was excited to see how she was going to react to them this year. 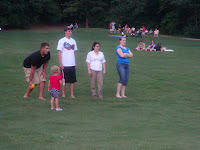 We just relaxed, ate, played a little Boccii Ball, collected a few golf balls (Sierra), and waited for the main event. Here's Cutie Bootie practicing her camera smile while sucking down an ice pop. Love those things. She shared with me. 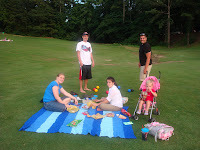 We had purple and blue. Yummy. 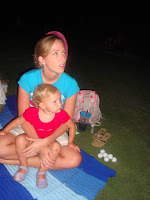 There were a few sparkers, flares, ground fireworks going on around us from other attendees while we waited that Sierra got pretty stoked about however those got really old for her and by the time the real fireworks started she had just about had it. She barely watched them. I'm surprised she sat on my lap long enough to snap this foto. But she wasn't feelin' it at all. 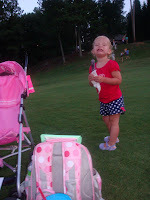 The funny thing is that for the entire week after the 4th she would say every day, "Mommy, I love fireworks!" Yeah right! That last pic is amazingly cool! !